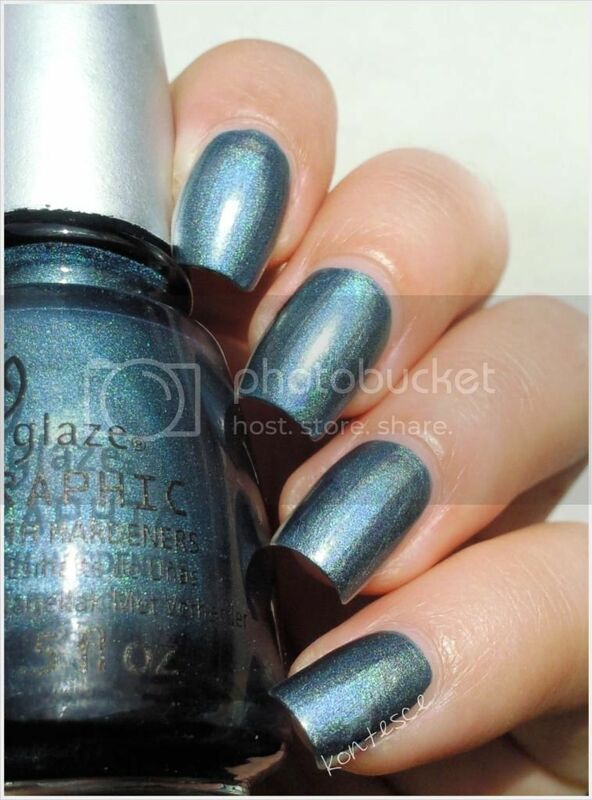 China Glaze Holographic koleksiyonu, kaldırılan OMG koleksiyonu yerine çıkmış bir holografik oje serisi. Koleksiyondan hoşuma giden renk sadece 2 adet oldu ve bunlardan ilki : Take A Trek. Kuruması hızlı. Tek katta opaklaşıyor. Renk olarak da çok çok beğendiğim farklı bir oje. Üzerinde herhangi bir cila kullanmadım. China Glaze Holographic Collection is up on sale now instead of the OMG Collection which is not temporarily available anymore. There are only 2 colours i loved in this collection. The first one is Take a Trek. I think, they don't seem pretty holographic as much as like the nailpolishes in the OMG Collection even though they are named as holographic in the new collection. I can say that they have completely different style of metallic appearance. It dries fast and becomes nontransparent only at one application. It is a different nailpolish which i loved to use because of its colour. I didn't use any shiner on it.